4 Chambre 4+ Bath Avec Dock et vue sur le lac. Grande retraite familiale avec beaucoup d'espace. Votre plage privée et d'un quai font pour le plaisir de l'eau. Apportez votre bateau et d'autres jouets de l'eau. Excellente pêche au large de la fin du point Bay Jaune. Le lancement de bateau est juste en face de la baie au parc national de la baie jaune. Nous vous proposons deux vue sur le lac terrasses avec barbecue et haut-parleurs extérieurs. A seulement quelques minutes de Bigfork ou Polson avec tous les commerces, théâtre, restaurants et grand golf. Let's get on thing straight, the kolache is number one. Could not have been more beautiful or had more fun. The place is designed for large family fun, this time it was just the two of us. Very romantic, weather was perfect for a fire indoors or out. Home was clean, heated up nicely, instantly was in vacation mode. If you're headed toward Big Fork it is the second driveway (almost positive) on your left after mile marker 17 (positive). If you have very little kids bring a pack and play and watch the water as access is right there, if you have big kids they should have a blast, no gaming devices at the house but mulitple TV's to accompany that if they don't like the outdoors. If you get the chance, go to Big Fork, especially in the summer; if you need WalMart go to Polson, saw a wild turkey one time so watch for animals! Thanks again, it was delightful!! Thanks Kimberly for your fine review! I'm so glad you had a wonderful time. One note to add: we've purchased a pack-n-play now so you don't need to bring one with you next time! 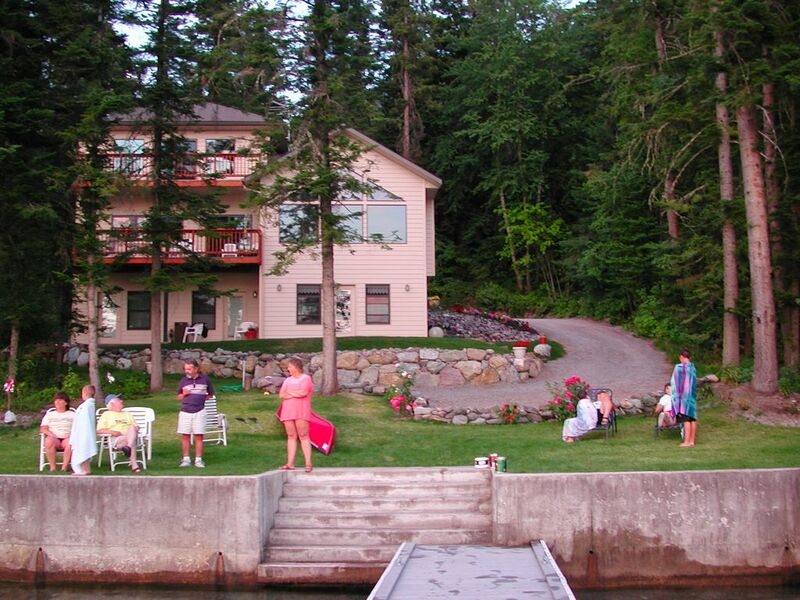 We have stayed at this house a couple times and you can’t beat the location on the lake. It’s right in the middle of the East side so easy to boat to everything on the lake or drive to Polson and Big Fork. A downside of the House is it’s lack of basics in the kitchen. Not very many pots and pans and what there is are not good at all, same with cutting knives. No Saran Wrap or bags for sandwiches and such. For the price of this place I would expect the kitchen to be better equipped. Thank you for your input! I'm very glad that you enjoyed your time on the lake! We have done some upgrades in the kitchen this year. We've put all new appliances in, plus new cookware. Beautiful home & property.was more than adequate for our group of 14. Home owner responded immediately to our ?'s. Great local food & attractions. We would definitely stay again!! So wonderful to be right on the water! The views from the house and yard were amazing! We loved having our family at Yellow Bay Resort. It was perfect for our family of 8 adults and 6 young grandkids. We brought our boat, jet ski, and paddleboard and it was so fun to have our own dock and be able to take advantage of that. The firepit in the front yard was great as well. The bedrooms and bathrooms were really clean and cozy - very comfortable. We did a lot of cooking in the kitchen and that worked out pretty well for us. Some of the small appliances could be updated. Planned on making chocolate malts, but blender did not work well. The main gathering space was a little dated, and could use some new, more comfortable furniture. There was one rocker recliner which was great with the grandkids, but it was not in good repair. Overall, we had an absolute great time, and would definitely return to this property. Thank you very much! Lovely place on Yellow Bay. there were some water issues which were promptly taken care of, otherwise no problems. Home well cared for. We hiked nearby trails, went to Biological Station. Close to Bigfork. Very expensive. We had many friends here during the week who enjoyed the grounds and the water. Amazing location! Best place on Flathead! We had a great experience with several families and children staying here-it was perfect! Being lakeside with a dock is unbeatable! Bigfork est situé sur le lac Flathead dans le centre du paradis des amateurs de plein air avec beaucoup de pêche, la navigation de plaisance et des possibilités de randonnée pour profiter. Situé dans la communauté est l'impressionnant et difficile d'Eagle Bend Golf Course. Polson est également juste en bas de la route à l'extrémité sud du lac Flathead. Le nom Bigfork est dérivé du nom Salish pour la région. Il y a des rapports d'une ferme et verger immédiatement au nord de Bigfork dès 1885. Everit L. Sliter partit 500 pommiers, cerisiers, pruniers et poiriers en 1892 sur la rive est du lac Flathead. En 1902. il platted le townsite Bigfork à l'embouchure de la rivière Swan. La rive est devenue depuis une cerise grande zone de culture. Wayfarers State Park se trouve juste au sud de la ville. (Copyright 2009, Montana Historical Society: Montana Place Names de Alzada à Zortman, Montana Historical Society Research Center de personnel). Bigfork a été nettement honoré avec des désignations dans les publications suivantes: Les 50 grandes villes de l'Ouest, 100 Best Small Art Villes, les grandes villes d'Amérique, et le Guide National Geographic pour les petites villes Escapes. Bigfork est exceptionnellement belle haut de gamme, station village, l'année qui regorge de galeries d'art, restaurants, golf, boutiques haut de gamme, et le théâtre en direct. Bigfork est situé sur le lac Flathead dans le centre du paradis des amateurs de plein air avec beaucoup de pêche, la navigation de plaisance et des possibilités de randonnée pour profiter. Situé dans la communauté est l'impressionnant et difficile d'Eagle Bend Golf Course. Le Summer Playhouse Bigfork est considéré comme l'un des plus beaux théâtres de répertoire du Nord-Ouest. Le rythme rapide, le chant de lumière, la danse et le jeu offrent un grand divertissement familial. Les comédies musicales de Broadway qui sont présentées du lundi au samedi en vedette certains des jeunes talents les plus remarquables du pays.